The 3D really works and doesn't require glasses or any other kind of trick. On the right side of the unit is a "slider" which allows the player to control the intensity of the 3D. When the slider is turned all the way down the game downgrades to 2D, slide it back up and it reverts to 3D. • Size: Approximately 5.3 inches wide, 2.9 inches long, 0.8 inches tall. • Weight: Approximately 8 ounces. • The unit at E3 is not the final design. • Top Screen: 3.53-inch widescreen LCD display, enabling 3D view without the need for special glasses; with 800x240 pixel resolution (400 pixels are allocated for each eye to enable 3D viewing). • Bottom Screen: 3.02-inch LCD with 320x240 pixel resolution with a touch screen. • Cameras: One inner camera and two outer cameras with 640x480 (0.3 Mega) pixel resolution. • The analog nub is a slider button and works a lot better than the PSP's nub. • The Game Cards will contain 2GB of space. • Communicates wirelessly in the 2.4 GHz band. • Multiple Nintendo 3DS systems can connect via a local wireless connection to let users communicate or enjoy competitive game play. • Will support IEEE 802.11 with enhanced security (WPA/WPA2). • Can connect with other DSes and the Internet even while sleeping. • Will Support 3D Hollywood movies. • The 3DS Game Card slot accepts 3DS Games and games from the DS Family of Systems. • Full backwards compatibility with the DS. • There is a home button -- similar to the one on the Wii. superb! Stie cineva vreo data de lansare? Nu pentru ca nu au anuntat nimic Nintendo. Asadar, se pare ca il vom avea pana prin luna martie anul viitor. Tot asa a aparut si Dsi Xl am impresia. Think I can do this whole post without a sperm reference? Too late! Seaman, the pet simulator on Dreamcast that nobody played but me (despite being narrated by Leonard Freakin' Nimoy), has been strongly hinted at as a possibility on the 3DS by creator Yoot Saito. Despite his incredible obscurity in the U.S. and reputation as having the "Weirdest Game of All Time" (according to Game Informer, issue 180), Japanese audiences loved him, enabling Seaman to have both a PS2 port and a never-localized sequel, while also being the third-best-selling Dreamcast game of all time in Japan. Where'd this hint come from? Twitter! A Saito follower expressed his interest in seeing a 3DS Seaman remake/sequel utilizing facial recognition, Twitter functionality, and internet capabilities, to which Saito responded that - while he couldn't get into specifics - the follower should keep hoping for such a game, and that he and his development team would do their best to meet his expectations. Friday night on talk show Late Night with Jimmy Fallon, Nintendo of America president Reggie Fils-Aime was asked when the company's upcoming glasses-free 3D portable will be release. His reply? Super faina reclama, stiu baietii de la Nintendo sa faca reclame. Legat de lansare, numai bine vine la anul sa stringem banuti. Sincer mi-e teama ca pretul va fi prohibitil insa ... who knows. Cat credeti ca o sa coste la lansare? Credeti ca va depasi 300 de euro? According to THQ's VP Ian Curran in a recent interview with CVG (linked above) new anti-piracy technology utilized in the 3DS will be foolproof to cracks from illegal downloaders alongside digital distribution. "We are thinking the release of new hardware should be good timing for a dramatic improvement of this situation. In addition to the function of �3D graphics without 3D glasses,� Nintendo 3DS will have enhanced wireless communication function. Nintendo 3DS will receive various pieces of information automatically if there is a chance of communication while a user carries it even when he or she does not try to start communication pro-actively by unfolding Nintendo 3DS. By combining Nintendo 3DS with such function, we are now planning to expand our digital-distribution type of business." 3DS-ul mi se pare incredibil si nu m-ar deranja sa nu se poata hackui. Daca jocurile vor fi foarte bune as plati pentru ele. PS3 ul a dovedit ca se poate, PSP Go ul a dovedit ca se poate - de ce n-ar dovedi si 3DS ul ca se poate - Nintendo are cel putin aceeasi capacitate ca si Sony pentru a scoate updateuri pe banda rulanta - impotriva pirateriei, ma mir ca nu apar mai des pentru DSi si DSXL. Keiji Inafune (Mega Man, Dead Rising): Video games need three things to be successful: a concept, a technology platform, and good marketing. 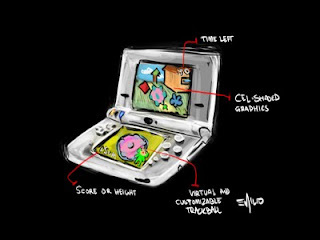 The Nintendo 3DS is a perfect example of those three things bundled into one. Hideki Kamiya (Okami, Bayonetta): 3D on a large screen has an impact on you and gets you that much closer to the game or movie you're watching, but 3D on the 3DS's smaller screen is interesting in its own right. Instead of feeling like you're 'really there,' you feel like it's 'really in the palm of your hand,' so to speak. Having these dynamic home 3D titles is great and all, but personally, I want to take a different approach and make games that take advantage of what a 3D portable has to offer. Hideo Kojima (Metal Gear Solid): I wear glasses, so I'm happy that 3D glasses are not needed. I directed the E3 demo. It was based off Metal Gear Solid 3 Snake Eater, but the backgrounds and character modeling were all redone in high polygon. It's not finalized, but we're thinking about CO-OPs and other things - elements fitting of a 3D and portable game machine. Shu Takami (Phoenix Wright): As a creator, I feel that a new challenge has started...I'd like to show a mystery in a 3D space.